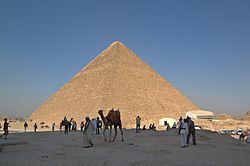 The Great Pyramid of Giza is a huge pyramid built by the Ancient Egyptians. It stands near Cairo, Egypt. It is the oldest of the Seven Wonders of the Ancient World, and the only one to remain mostly intact. When it was built it was 146.5 metres (481 feet) tall. It was the tallest building in the world for over 3,800 years. The pyramid was built for Khufu, an Egyptian pharaoh. It was perhaps built by Khufu's vizier, Hemiunu. It is believed that it took about 20 years to build, and was completed around 2570 BC. When it was built, the Great Pyramid was covered by stones that formed a smooth outer surface. Some of these stones can still be seen around the base. Most of what can be seen of the pyramid now is its basic core of 2,300,000 blocks of limestone and granite. 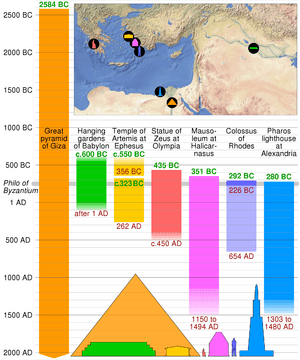 There have been many different theories to explain how the pyramid was built. Most accepted building ideas are based on the idea of moving huge stones from a quarry and dragging and lifting them into place. Scientists found that the Great Pyramids of Giza were not built by slaves, but workers who were paid for working. Their graves were found near the pyramid in 1990. It is believed by Egyptologists that the pyramid was built as a tomb for Fourth Dynasty Egyptian pharaoh Khufu (often called as "Cheops") and was constructed over a 20-year period. Khufu's vizier, Hemiunu (also called Hemon), is believed by some to be the architect of the Great Pyramid. The mass of the pyramid is estimated at 5.9 million tonnes. The volume, including an internal hillock, is roughly 2,500,000 cubic metres (88,000,000 cu ft). Based on these estimates, building the pyramid in 20 years would involve installing approximately 800 tonnes of stone every day. The pyramid remained the tallest man-made structure in the world for over 3,800 years, unsurpassed until the 160-metre-tall (520 ft) spire of Lincoln Cathedral was completed c. 1300. The accuracy of the pyramid's workmanship is so good that the four sides of the base have an average error of only 58 millimetres in length. The sides of the square base are closely aligned to the four cardinal compass points (within four minutes of arc) based on true north, not magnetic north, and the finished base was squared to a mean corner error of only 12 seconds of arc. The Great Pyramid consists of an estimated 2.3 million blocks which most believe to have been transported from nearby quarries. The Tura limestone used for the casing was quarried across the river. 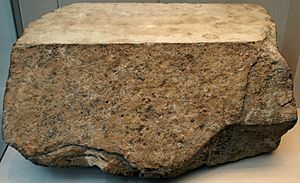 The largest granite stones in the pyramid, found in the "King's" chamber, weigh 25 to 80 tonnes and were transported from Aswan, more than 800 km (500 mi) away. Traditionally, ancient Egyptians cut stone blocks by hammering into them wooden wedges, which were then soaked with water. As the water was absorbed, the wedges expanded, causing the rock to crack. Once they were cut, they were carried by boat either up or down the Nile River to the pyramid. It is estimated that 5.5 million tonnes of limestone, 8,000 tonnes of granite (imported from Aswan), and 500,000 tonnes of mortar were used in the construction of the Great Pyramid. At completion, the Great Pyramid was surfaced by white "casing stones" – slant-faced, but flat-topped, blocks of highly polished white limestone. These were carefully cut to what is approximately a face slope with a seked of 5½ palms to give the required dimensions. Visibly, all that remains is the underlying stepped core structure seen today. In AD 1303, a massive earthquake loosened many of the outer casing stones, which were then carted away by Bahri Sultan An-Nasir Nasir-ad-Din al-Hasan in 1356 to build mosques and fortresses in nearby Cairo. Many more casing stones were removed from the great pyramids by Muhammad Ali Pasha in the early 19th century to build the upper portion of his Alabaster Mosque in Cairo not far from Giza. These limestone casings can still be seen as parts of these structures. Later explorers reported massive piles of rubble at the base of the pyramids left over from the continuing collapse of the casing stones, which were subsequently cleared away during continuing excavations of the site. 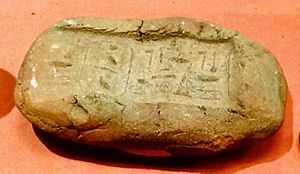 A few of the casing stones from the lowest course can be seen to this day around the base of the Great Pyramid, and display the same workmanship and precision that has been reported for centuries. 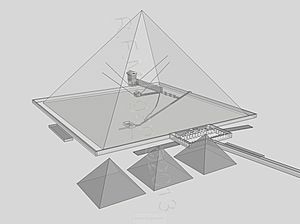 Many theories have been proposed regarding the pyramid's construction techniques. Many disagree on whether the blocks were dragged, lifted, or even rolled into place. 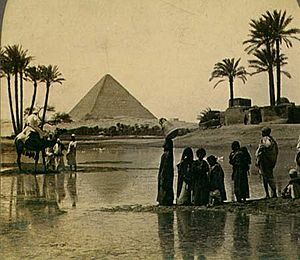 The Greeks believed that slave labour was used, but modern discoveries made at nearby workers' camps associated with construction at Giza suggest that it was built instead by tens of thousands of skilled workers. Egyptologists, estimated that the total project required an average workforce of about 14,500 people and a peak workforce of roughly 40,000. Without the use of pulleys, wheels, or iron tools, they used critical path analysis methods, which suggest that the Great Pyramid was completed from start to finish in approximately 10 years. The original entrance to the Great Pyramid is on the north, 17 metres (56 ft) vertically above ground level and 7.29 metres (23.9 ft) east of the centre line of the pyramid. 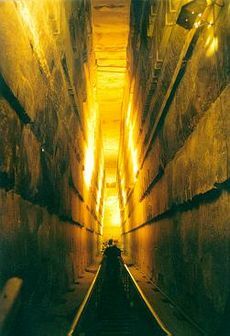 From this original entrance, there is a Descending Passage 0.96 metres (3.1 ft) high and 1.04 metres (3.4 ft) wide, which goes down at an angle of 26° 31'23" through the masonry of the pyramid and then into the bedrock beneath it. After 105.23 metres (345.2 ft), the passage becomes level and continues for an additional 8.84 metres (29.0 ft) to the lower Chamber, which appears not to have been finished. There is a continuation of the horizontal passage in the south wall of the lower chamber; there is also a pit dug in the floor of the chamber. Some Egyptologists suggest that this Lower Chamber was intended to be the original burial chamber, but Pharaoh Khufu later changed his mind and wanted it to be higher up in the pyramid. 28.2 metres (93 ft) from the entrance is a square hole in the roof of the Descending Passage. Originally concealed with a slab of stone, this is the beginning of the Ascending Passage. The Ascending Passage is 39.3 metres (129 ft) long, as wide and high as the Descending Passage and slopes up at almost precisely the same angle to reach the Grand Gallery. The lower end of the Ascending Passage is closed by three huge blocks of granite, each about 1.5 metres (4.9 ft) long. One must use the Robbers' Tunnel (see below) to access the Ascending Passage. At the start of the Grand Gallery on the right-hand side there is a hole cut in the wall. This is the start of a vertical shaft which follows an irregular path through the masonry of the pyramid to join the Descending Passage. Also at the start of the Grand Gallery there is the Horizontal Passage leading to the "Queen's Chamber". The passage is 1.1m (3'8") high for most of its length, but near the chamber there is a step in the floor, after which the passage is 1.73 metres (5.7 ft) high. The "Queen's Chamber" is exactly halfway between the north and south faces of the pyramid. At the eastern end of the chamber there is a niche 4.67 metres (15.3 ft) high. The original depth of the niche was 1.04 metres (3.4 ft), but has since been deepened by treasure hunters. In the north and south walls of the Queen's Chamber there are shafts, which unlike those in the King's Chamber that immediately slope upwards, are horizontal for around 2 m (6.6 ft) before sloping upwards, their purpose is unknown. At the end of one of his shafts, a ball of black diorite (a type of rock) and a bronze implement of unknown purpose was discovered. Both objects are currently in the British Museum. The Grand Gallery continues the slope of the Ascending Passage. At the base it is 2.06 metres (6.8 ft) wide, but after 2.29 metres (7.5 ft) the blocks of stone in the walls are corbelled inwards by 7.6 centimetres (3.0 in) on each side. There are seven of these steps, so, at the top, the Grand Gallery is only 1.04 metres (3.4 ft) wide. It is roofed by slabs of stone laid at a slightly steeper angle than the floor of the gallery, so that each stone fits into a slot cut in the top of the gallery like the teeth of a ratchet. The purpose was to have each block supported by the wall of the Gallery, rather than resting on the block beneath it, in order to prevent cumulative pressure. The "King's Chamber" is 20 cubits or 10.47 metres (34.4 ft) from east to west and 10 cubits or 5.234 metres (17.17 ft) north to south. It has a flat roof 11 cubits and 5 digits or 5.852 metres (19 feet 2 inch) above the floor. 0.91 m (3.0 ft) above the floor there are two narrow shafts in the north and south walls (one is now filled by an extractor fan in an attempt to circulate air inside the pyramid). The purpose of these shafts is not clear: they appear to be aligned towards stars or areas of the northern and southern skies, yet one of them follows a dog-leg course through the masonry, indicating no intention to directly sight stars through them. 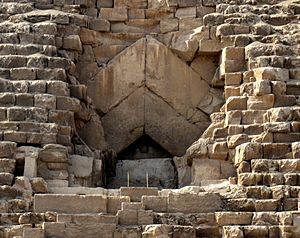 They were long believed by Egyptologists to be "air shafts" for ventilation, but this idea has now been widely abandoned in favour of the shafts serving a ritualistic purpose associated with the ascension of the king’s spirit to the heavens. The King's Chamber is entirely faced with granite. Above the roof, which is formed of nine slabs of stone weighing in total about 400 tons, are five compartments known as Relieving Chambers. The first four, like the King's Chamber, have flat roofs formed by the floor of the chamber above, but the final chamber has a pointed roof. Vyse suspected the presence of upper chambers when he found that he could push a long reed through a crack in the ceiling of the first chamber. From lower to upper, the chambers are known as "Davison's Chamber", "Wellington's Chamber", "Nelson's Chamber", "Lady Arbuthnot's Chamber", and "Campbell's Chamber". It is believed that the compartments were intended to safeguard the King's Chamber from the possibility of a roof collapsing under the weight of stone above the Chamber. As the chambers were not intended to be seen, they were not finished in any way and a few of the stones still retain masons' marks painted on them. One of the stones in Campbell's Chamber bears a mark, apparently the name of a work gang. The only object in the King's Chamber is a rectangular granite sarcophagus, one corner of which is broken. The sarcophagus is slightly larger than the Ascending Passage, which indicates that it must have been placed in the Chamber before the roof was put in place. 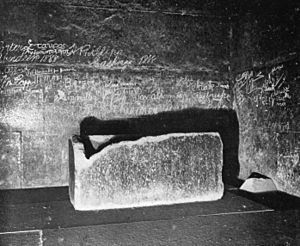 Unlike the fine masonry of the walls of the Chamber, the sarcophagus is roughly finished, with saw marks visible in several places. This is in contrast with the finely finished and decorated sarcophagi found in other pyramids of the same period. 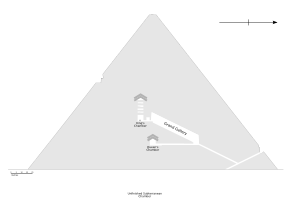 Great Pyramid of Giza Facts for Kids. Kiddle Encyclopedia.